Head back to school this year in a brand-new crossover SUV. The 2018 Dodge Journey is fully equipped to take you and all of your gear back to campus. Here are a few reasons the Journey is perfect for students. There’s nothing more important than safety, especially if you’re going to be driving a lot and making regular trips to and from campus. 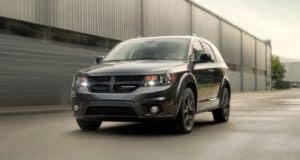 Fortunately, the 2018 Dodge Journey has some great features to help keep you safe. The crossover SUV comes with a rear backup camera, which makes parking and backing up easier and safer. The Journey has also been awarded a four-star rating from the National Highway Traffic Safety Administration, which evaluates cars based on their crash test results. You’ll need plenty of room to store all your clothes, schoolbooks, and everything else that you’ve taken home for the summer. Rest assured that the 2018 Dodge Journey has more than enough cargo space for all this and more. With all of the crossover’s seats in use, the vehicle can hold about the equivalent of two pieces of luggage. But if you flip down the 50/50 folding rear seats and 60/40 folding middle seats, that cargo space expands to allow for the equivalent of 25 pieces of luggage. This is a total of about 68 cubic feet of storage. If you’ve got a lot of highway between home and school, you’ll be pleased with the excellent fuel efficiency of the 2018 Dodge Journey. Whether you choose the 3.6-liter V-6 engine or the 2.4-liter four-cylinder engine, you’ll have more than enough power to make the trip. And if you need to haul a trailer full of furniture to set up your new dorm room, this SUV has got you covered. A fully outfitted Dodge Journey is capable of hauling up to 2,500 pounds. College is expensive; choosing a new SUV doesn’t have to be. The 2018 Dodge Caravan starts at an MSRP of just $22,995. Even the entry-level trim offers a standard rear backup camera and seating for seven passengers. If you do want to take advantage of more advanced features, there are three other trims available. Upgrading will give you access to perks like a bigger engine, LED tail lamps, leather-trimmed seats, and an 8.4-inch touchscreen display. Even the top-of-the-line GT trim starts at a reasonable price of $33,095. Chances are that you’ll be spending a lot of time in your new Journey. Make yourself comfortable by enjoying the amenities of the SUV’s luxurious cabin. Set your driver’s seat exactly that way you like it; the seat has six-way power adjustment and four-way lumbar adjustment. If you’re carpooling with other students, everyone will be happy to have plenty of room in the back. The rear seats can be accessed from either side of the vehicle, and the stadium-style seat design ensures maximum comfort for everyone. Don’t miss your chance to upgrade to a new Dodge Journey this school year. Browse the inventory at Westgate Chrysler Jeep Dodge and schedule a test drive today.